The moral character of China’s single-child generation has been studied by Chinese researchers since the early 1990s. Recent acts of animal cruelty by college students turned this subject of academic inquiry into a topic of public debate. This study joins the inquiry by asking if the perceived unique traits of the single-child generation, i.e. selfcenteredness, lack of compassion, and indifference to the feelings of others, are discernible in their attitudes toward animals. Specifically, the study investigates whether the college students are in favor of better treatment of animals, objects of unprecedented exploitation on the Chinese mainland. With the help of two surveys conducted in selected Chinese universities, this study concludes that the college students, a majority of whom belong to the single-child generation, are not morally compromised. A high percentage of the surveyed expressed empathy toward animals and opposed animal cruelty. This finding suggests that upbringing in families with better material conditions has not undercut the moral development of the students. Importantly, the study supports the view that China is philosophically ready for legislation on animal welfare despite the remaining ideological, cultural, and economic factors that discourage societal activism for animal protection. Shuxian, Z., Li, P. J., & Su, P. F. (2005). 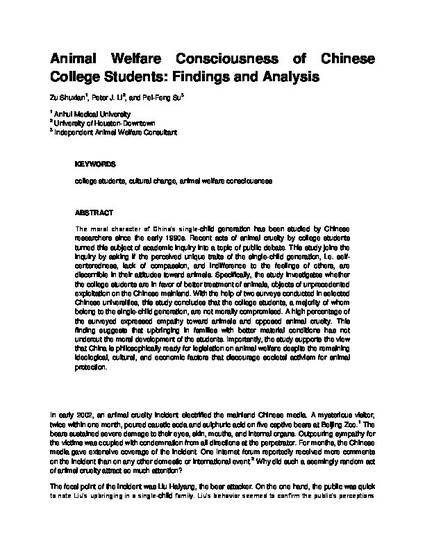 Animal welfare consciousness of Chinese college students: findings and analysis. China Information, 19(1), 67-95.